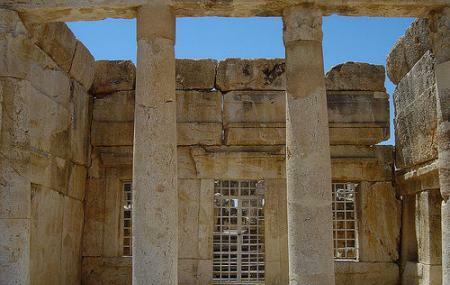 The ruins of this unfinished 200 BCE Hellenistic castle lie to the west of Amman close to the village of Iraq al-amir. Next to the castle are some old burial caves. It is thought that once upon a time a reflecting pool surrounded the castle. It is made of stone and is two stories tall. It is notable for being constructed out of large single blocks of stone, some of which bear the sculpted figures of lions and eagles. Not much is known about it other than its possible builder, Hyrcanus of Jerusalem, governor of Jordan, who used it as a pleasure Palace. The name of the castle can be translated into Castle of the Servant, referring to the Governor's role as a servant of the king. The castle was somewhat restored by a French team in the 1980s. The area is somewhat isolated and there are no services. How popular is Qasr Al-abd? People normally club together Cave Of The Seven Sleepers and King Hussein Mosque while planning their visit to Qasr Al-abd.